Okay. I apologize for being so late with this. Our assignment was two write the same scene from four points of view. I chose to write about the story of the Fall. I’m not really sure I like it, but oh well. This week has been slightly crazy… I will have to add pictures later — again. Sigh. I hope you enjoy. She leaned her dark head on Adam’s strong shoulder as they sat by the headwaters of the Pishon, dangling their feet in its cool liquidity and feeling the current ripple over their bare legs. A butterfly flitted past the cascade a few yards away, its brilliant cerulean blending into the rainbow mist of the waterfall. What a beautiful world God had created! “That’s perfect!” Eve cried. “Come soon!” she added over her shoulder as she ran off to the trees. There was the pomegranate tree, and Eve plucked her prize from the branch. Glancing over, she was the two special trees: the Tree of Life and the Tree of the Knowledge of Good and Evil. These two were in the very center of this garden – Eden. God had told them not to eat from the latter. She stepped closer to the two trees, looking interestedly at the unforbidden one. Just then, she noticed something long and supple creep down the branch of the other tree that extended out towards her. It was a serpent, one of the fascinating things with such a flexibility and litheness that made her shiver with delight. Its shimmering black eyes stared down at her as he spoke, “Did God really say, ‘You must not eat from any tree in the garden?’” It nodded toward the pomegranate in her hand. Eve glanced at the fruit. It was orange and fuchsia and violet with clusters of dark, glossy seeds hanging from the bottom – both good for food and pleasing to the eye. “And if it is desirable for gaining wisdom, knowledge, like God…” Eve glanced backwards at Adam, coming towards her through the grove. She reached out and picked the nearest of the beautiful, forbidden orbs. She lifted it up to her lips and sank her teeth into it. It was juicy and sweet and savory all at once. Adam was there beside her. “Try it Adam! It’s wonderful!” He took it from her hand and took a bite. Eve felt dimly aware of a bitter aftertaste, and, glancing over at Adam, suddenly gasped. Adam gazed across the river at the marvelous Behemoth, tearing up huge mouthfuls of swamp grass. Its huge tail stretched out for yards and yards behind it, so thick it reminded Adam of a cedar tree. The beast lifted its head, stretching out its long neck to its full height, towering above the small date palms nearby. “What awesome creatures God has made!” he thought, amazed at the dragon’s incredible form. “That’s perfect!” she cried delightedly. “Come soon!” she added over her shoulder as she ran off to the trees. The animal’s long neck looked up towards the voice. Adam nodded to the creature and turned to go to Eve. He could just make out her form between the vegetation. He strode across the verdure and entered the cluster of trees. 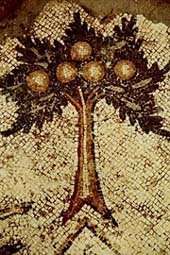 Eve was picking a colorful fruit from a tree – the Tree of the Knowledge of Good and Evil that was forbidden. “Eve?” he reached her just as she bit the fruit. “Try it Adam! It’s wonderful!” she told him. He wavered momentarily, looking at the juice dripping from the bitten thing. Eve had not died yet, and if she could do it, he could, of course. He took it from her hand and took a bite. It was so juicy, sweet, and savory all at once! Oddly, after he swallowed, there was a bitter flavor. He looked up at his wife and was suddenly aware of her form in a way he’d never realized before. The Devil loved this serpent form. It was so long and lithe and crafty – and he loved the way it hissed. He crept through the grass towards the center of the garden. In the very middle was a tree he had plans for. This was the Tree of the Knowledge of Good and Evil. If he could just get the humans to disobey God, to eat a bite of this fruit… Think of the vengeance he could wreak! He heard something walking in the grove. Darting his black eyes towards the noise, he recognized the woman! “She will be easier to manipulate than the man”, he thought with glee. She stepped towards the Tree of Life just beside his own branch. The serpent crept down the limb that stretched out towards her. The woman glanced at the moving thing, and Lucifer seized his chance. Looking up at her, he spoke: “Did God really say, ‘You must not eat from any tree in the garden?’” He nodded towards the pomegranate in her hand. “The best way to go about this is to begin by casting doubts in her mind,” he smirked deviously. “She must not have been paying attention when God said that, because I know He didn’t say anything about touching it. Well, it makes my part easier,” he hissed to himself. 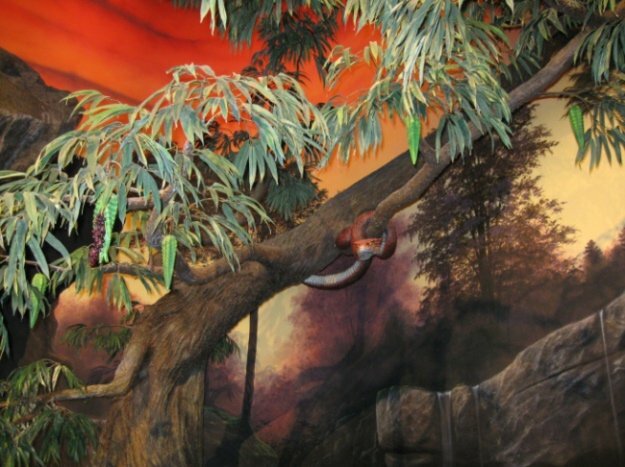 “You will not surely die – look at me, touching it,” the serpent scoffed out loud to Eve. He twitched his long, emerald tail. “For God knows that when you eat of it your eyes will be opened, and you be like God, knowing good and evil,” he cunningly twisted the truth. He saw her look at the fruit, contemplating his words. “Good, good! Keep it up!” he would have rubbed his hands in delight if serpents had such appendages. She was debating mentally, he saw. She was reaching for the forbidden fruit. She was biting it. She was handing it to the man who had just come up beside her. It was too good to be true! He was eating it, too! His plans had come to fruition – literally, he chuckled maliciously to himself. The fruit hung on the branch, its orange, fuchsia, and violet shimmering in the dappled sunlight that filtered through the verdure overhead. The cluster of seeds suspended from it felt shook a little in the breeze. It was the one fruit in all this gorgeous Garden of Eden that had not been tried. It was the fruit of the Tree of the Knowledge of Good and Evil – the one tree the Creator had set off-limits. A serpent snaked its way past the fruit and slunk its way up the trunk of the tree from which the colorful dainty hung from. A few minutes later, the woman walked past the towards the pomegranate tree a few feet away. After picking its produce, she glanced at the Tree of Knowledge of Good and Evil and then stepped towards the tree beside it, the Tree of Life. Down the branch the forbidden fruit hung from, the serpent crept in the direction of the woman. It talked to the woman about the fruit. “When you eat of it your eyes will be opened, and you be like God, knowing good and evil,” it spoke sly. The woman looked at the fruit. Its rosy colors shimmered enticingly. After a moment of hesitation, the woman reached out and plucked the fruit. Two seconds later, she bit into its perfectly ripe form, its juice staining her mouth. “Try it Adam! It’s wonderful!” she declared to the man who had come up beside her. He, too, bit into the accursed thing. Very interesting! I like how you replaced the traditional apple with a pomegranate. I love your unique insights on the Fall. Great job!